Lena, can you tell me a bit about yourself and your family? What is your story? Hello, I am Lena and I live with my husband and our two children Madita (6) and Michel (3) in Germany. My husband and I are both engineers. 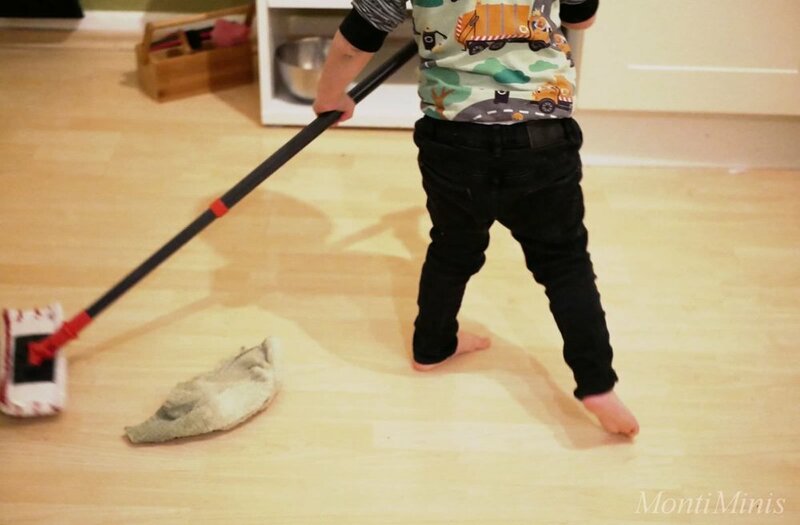 While he worked fulltime the last years we decided on me staying home with our children until they each entered Kindergarten at the age of 2,5. Since they are both visiting Kindergarten now, not a Montessori Children's house, but a lovely Kindergarten following Montessori principles, i have started to work part time again last year. On your blog you are passionately sharing with your readers about your Montessori-inspired home and education of your children. Why Montessori? When I was 16 I visited an exhibition about Maria Montessori which left quite an impression on me but after that I didn't think about her for a long time, finishing school, traveling the world and studying. 15 years later I stumbled across her again when Madita was 1 year old. We had moved to a new city before she was born and I was a bit isolated as a mom at first. I visited some parent child courses and soon noticed that our way of raising her was often different from other parents around us. We were following a respectful, attachment parenting oriented path from birth. So when I found Maria Montessori again on my research online for some guidance on ways to respectfully raise children it just clicked and I basically fell in love with her approach the more I read about it. I think what resonates with me in particular is that the core of the Montessori approach is all about love, respect and peace. All three regarding the way we raise our children but also in hope for everyone and everything on this beautiful planet we live on. 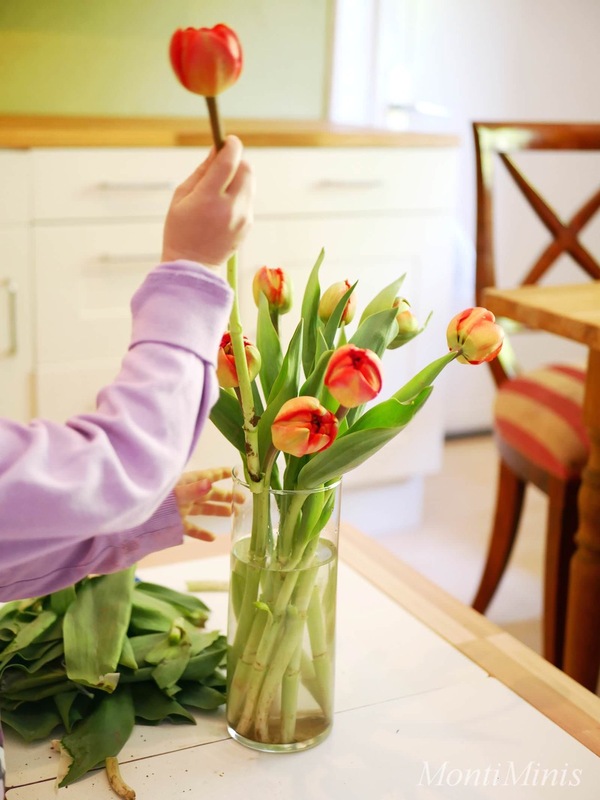 What is one thing we should know when we want to “Montessori at home”? To me Montessori is a way of life. In doing 'Montessori at home' we are trying to live respectfully and peacefully with our children and as a family. It's about spending time together, lot's of time outdoors in nature and our cultural surroundings, observing and following our children's current needs and interests and slowing our daily lives down as much as possible. Your children are 3 and 6 years old. How do they share their space, materials and toys ? 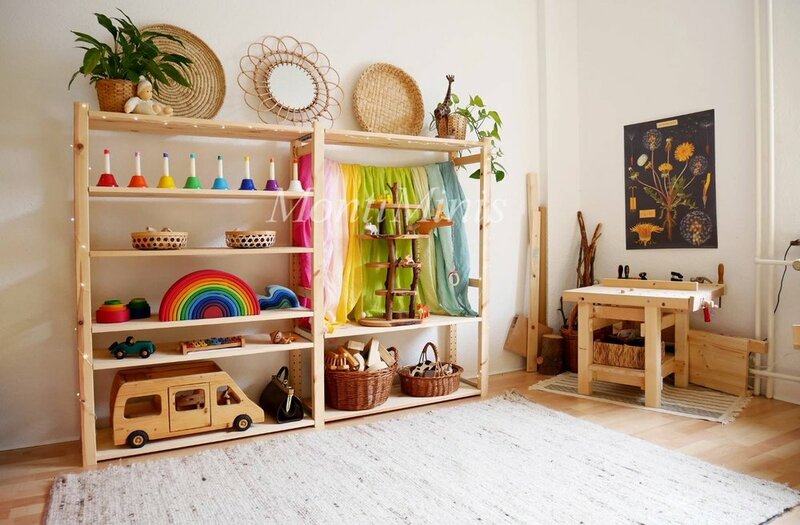 What tips you would give to parents who want to set up a Montessori-inspired home and have more than one child ? In our current apartment they both have their own room. It is a space where they can go to when they need some time for themselves. But usually they play with eachother anyways. I have recently changed our setup again to the way we basically started with when they were still at home with me fulltime: We now have a what i call 'Montessori inspired corner' with Montessori inspired materials and more learning oriented activities following their current interests for both of them in our living room while most of their toys in their rooms are for openended play. I am always experimenting with our setup following their needs and interests! 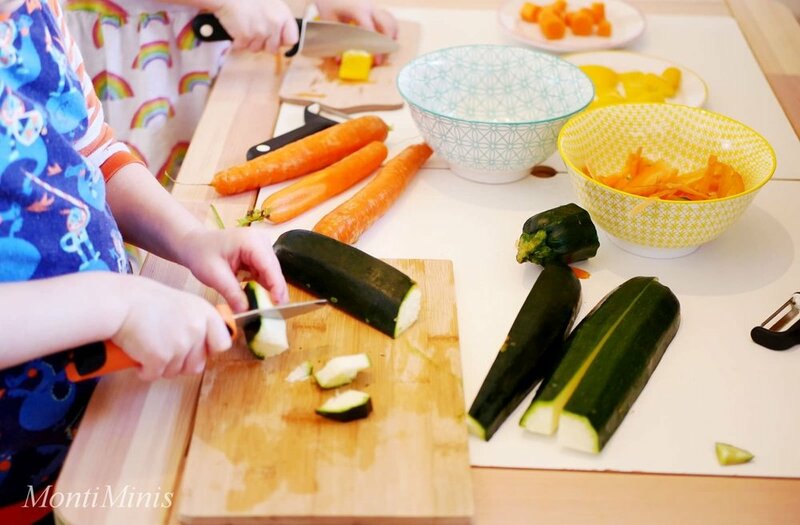 Regarding having more than one child and setting up your home Montessori-inspired I think you should do what works best for you and your family. I get asked very often how I managed having open shelves all the time. My simple answer is: I dind't! Do not follow the pressure of having open shelves at any time. Set those up the way you feel it works for you and it is safe for your children. When Michel was crawling and still putting everything in his mouth I reduced the number of our open shelves drastically and for his big sister I did NOT have ANY open shelves in our apartment with small parts he could choke on. It just would have driven me crazy. I really wanted every part of our apartment to be a Yes-space for him and so during that time I somewhat limited Maditas prepared environment making it work with a mouthing baby. I don't think however Madita was missing out very much during that short phase because I still did offer her small parts activities on our kitchen table, far off from the ground. Besides Montessori, what else inspires you ? I find Magda Gerbers RIE Approach and Peter Greys thoughts on independent play very inspiring. I also love our colorful openended toy shelves which are full of Waldorf toys. How your days look like? Do you have a particular daily and weekly rhythm? Our weekly rhythm has changed a lot since the children started to go to Kindergarten. They both attend a musical class offered in Kindergarten and a swimming class once a week. Other than that I try to slow down our afternoons as much as possible, keeping plenty room for play, trips to parks and meeting friends. On saturday we are doing our grocery shopping with the whole family. We visit our local farmers market to buy seasonal and regional fruits and vergetables and the children get to pick and buy the new flowers for our apartment for the upcoming week. Sundays are usually very slow and relaxed leaving plenty of time for play. Last year we rented a piece of land with friends on a farm outside of our city, so we would go to our field to harvest fresh vegetables together once a week. Who is “your village” when it comes to raising your children? We don't have any close family where we currently live so our village here are our friends who most of them are families with children. As I wrote earlier we were quite isolated in the beginning which was sad and somewhat depressing especially for me being a new mom and staying alone at home fulltime with a baby. It took some time to find our village here but we are very happy where we are now. My parents and my husband's parents are visiting frequently too, so they play a vital role in our children's lives as well. What nurtures you and how do you make time for self-care? This is something I struggled with when the children were younger and I am still working on. I really had to learn how important it is to look after myself too, as a woman and mother. My husband was of great help. When the children were still at home with me fulltime, he would go out with them to visit the playground on the weekends which gave me time to get a moment for myself. Then I'd enjoy taking a long shower (alone! Without a toddler watching and waiting ;)), eating some chocolates all by myself and doing some joga or meditating. Since I am not nursing anymore and my husband can easily bring the children to bed I started to go out and meet friends in the evenings again more often which has been lovely. As a mother: Montessori books. As a woman: no book in particular. Am I doing a good job at being a mom? A question I ask myself often as I am sure every mom does from time to time, especially on days I am not doing the 'Montesori at home' I thrive to do, because those days happen too! But years ago I realized it goes together with the question: Do I have to be perfect? I am in no way perfect and I sure never will be. But I am trying to do as best as I can and am forever thankful for the time I get to spend with my children. When they think back to their childhood once they've grown up I hope their memories are filled with laughter and awesome experiences.